The Very Rev. 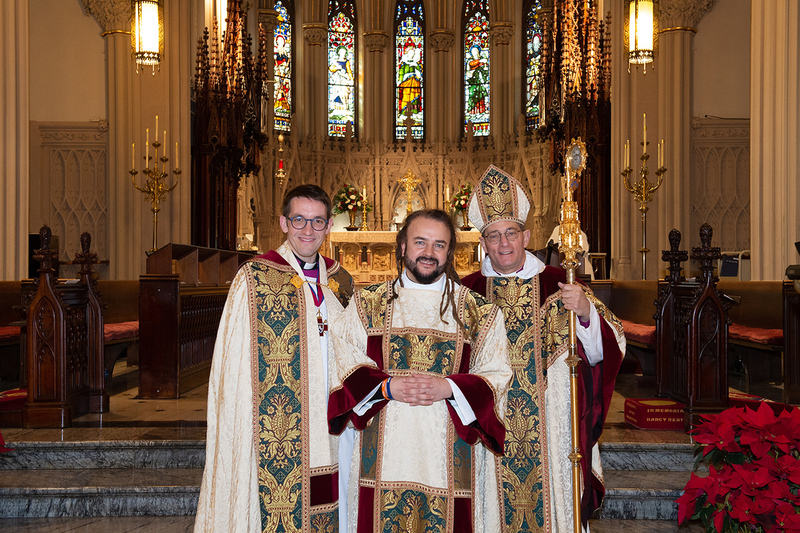 Dr. Michael Sniffen, left, the Rev. Adam Bucko and Long Island Bishop Larry Provenzano. GARDEN CITY, N.Y., April 10, 2019—The Cathedral of the Incarnation announces the appointment of the Rev. Adam Bucko to serve as Minor Canon beginning this summer. Bucko has been an influential voice in the movement for the recovery and renewal of Christian Contemplative Spirituality. Bucko is also the co-founder of the Reciprocity Foundation, serving homeless and marginalized youth in New York City. As part of his full-time role, Bucko will be involved in the development and launch of the cathedral’s new Center for Spiritual Imagination. Prior to his ordination, Bucko co-authored the book Occupy Spirituality: A Radical Vision for a New Generation with Matthew Fox. The New Monasticism: A Manifesto for Contemplative Living, which he co-authored with Rory McEntee, was published in 2015. Both books focused on re-envisioning an inclusive and engaged spirituality for the 21st century. “I am excited and energized to be joining the cathedral team to work on developing programs that reimagine what our tradition has to offer to the contemporary world,” said Bucko.